Plants, being sessile organisms, constantly withstand environmental fluctuations, including low- temperature, also referred as cold stress. Whereas cold poses serious challenges at both physiological and developmental levels to plants growing in tropical or sub-tropical regions, plants from temperate climatic regions can withstand chilling or freezing temperatures . Several cold inducible genes have already been isolated and used in transgenic approach to generate cold tolerant plants. The conventional breeding methods and marker assisted selection have helped in developing plant with improved cold tolerance, however, the development of freezing tolerant plants through cold acclimation remains an unaccomplished task. Therefore, it is essential to have a clear understanding of how low temperature sensing strategies and corresponding signal transduction act during cold acclimation process. Herein, we synthesize the available information on the molecular mechanisms underlying cold sensing and signaling with an aim that the summarized literature will help develop efficient strategies to obtain cold tolerant plants. Keywords: Cold, Calcium, Protein kinase, CBF, Signaling, Phosphorylation. Keywords:Cold, Calcium, Protein kinase, CBF, Signaling, Phosphorylation. Abstract:Plants, being sessile organisms, constantly withstand environmental fluctuations, including low- temperature, also referred as cold stress. Whereas cold poses serious challenges at both physiological and developmental levels to plants growing in tropical or sub-tropical regions, plants from temperate climatic regions can withstand chilling or freezing temperatures . Several cold inducible genes have already been isolated and used in transgenic approach to generate cold tolerant plants. The conventional breeding methods and marker assisted selection have helped in developing plant with improved cold tolerance, however, the development of freezing tolerant plants through cold acclimation remains an unaccomplished task. Therefore, it is essential to have a clear understanding of how low temperature sensing strategies and corresponding signal transduction act during cold acclimation process. 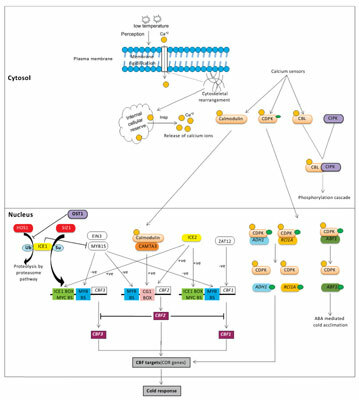 Herein, we synthesize the available information on the molecular mechanisms underlying cold sensing and signaling with an aim that the summarized literature will help develop efficient strategies to obtain cold tolerant plants.